Alexandra Yorke is one of a few trusted clairvoyants working with police on murder cases, but she has a secret. She isn't a clairvoyant, she's a witch unlike any other she has ever met. For years she has struggled to control her gifts, but years living inside one serial killer's head after another has taken its toll, and Alex has reached the end of the road. Barely able to control her gifts any longer, Alex retreats from the world to live at her grandparents farm where she grew up. Seclusion is her answer, but the world will not leave her alone. A few months of peace is all she has before a friend calls her in need of help and Alex can't say no. A body has been found, and evidence points to a connection with witches. Who is it that everyone just knows is a witch? Why, that strange woman who just moved back from the big city of course. This is a great read!The main character has been called a witch,among other things.It turns out those people were right.We get to see into life in a different world than ours and find a killer and friendship along the way.Mikael Naramore was a terrific pic for narrator of this book.I was gifted a copy for a fair review. loved it, onto book two! What did you like most about Rune Gate? The Narrator, Mikael Naramore, has a clear and even voice, if sometimes coming across a little slow in his reading, but that might just be me. I like his accent, his reading voice, which is American with a hint of something else, but not quite sure what. He has clearly voiced all the characters, and I could tell who was speaking without the narrative telling me so. This is the first time I've listened to Mr Naramore, and I would be very happy to listen to him again. I was given a copy of the audio version of this book, in exchange for review. But I digress, let me tell you why I loved this. Alex is best described as a witch with paranormal powers. She sees things, cn hear your thoughts and if you touch?? Lets just say, don't. When asked to "see" into a crime scene, she relives the victim's last few moments, in all their gory, painful detail. Its the runes carved on the victim's body that sent Alex's spidey senses off (my words, not her's) and she finds herself in a good old fashioned battle of good versus evil. But then Douglas arrives. Out of nowhere. Quite literally. With news that actually makes Alex believe that real magic does exist. But more bodies turn up, and its a race against time to stop The Rune Killer. LOVE LOVEE LOVED this book. It has magic and mayhem, murder and mischief. Jilted lovers and old friends. Although its clean, it is fairly graphic in its description of the violence these victims suffered, especially the first one. Made me cringe a bit. All in all, a thoroughly fabulous way to spend the 7 hours it took to listen to. 5 stars for the book, and 5 for the narration. My kind of book. Never read this author before but found his way with words interesting as well as the story he had written with them. Thankyou all. Would you consider the audio edition of Rune Gate to be better than the print version? I definitely prefer the audio because it brings the story and characters to life. This is hard because I loved all the characters but I think Douglas wins by a fraction. He is such a charmer. He brings his voice! I loved how his tone and accent changed for each character and while, at first, I did think it odd that a male was voicing a female MC, Mikael really pulls it off. There are way more male characters than female ones so it made sense to have a male voice. I was really impressed by his range of accents. No because I knew it was too long to listen to in one sitting. I did look forward to jumping back into the world the author has created though and I was eager to see what happens next. I'm so glad I got the chance to listen to this story. While reading it would of been good, listening to it was better. The story really came to life and I loved experiencing it along with the characters. The story is shrouded in mystery and when it comes together, it really surprised me because I wasn't expecting Douglas or where he came from. I expected a witchy read but this surpasses that. Mark E Cooper put a lot into his story and it shows. His characters are all well developed and the plot is fast paced. The story drew me in and I really can't wait to see what happens next. This is one I'd definitely recommend you listen to both for the story and the narrators voice. It's an enjoyable and fairly quick read. This is a great beginning to an Urban Fantasy series! Alex is a witch and clairvoyant who helps the police with some of their cases. She can see memories when she touches the victim's body, which helps the police tremendously in their investigation. Even if some of them don't believe her. She can hear people's thoughts and see visions when people touch her, so she lives alone in the forest so she can have some peace. Her world gets completely turned around when a couple of guys from another world enter into hers. This was a great start to the series and I'm looking forward to book 2. I thought that Mikael did a fabulous job with the narration. All of the characters had their own voice and accent, which made it very easy to know who was talking at all times. He also did a great job with the female characters! I have listened to other stories about Runes but this one was different than any other that I've listened to. I don't like going in to details because it gives the story away. I thought the author Mark E. Cooper did a wonderful job with creating this story. I felt everything was written perfectly. I loved how he chose to create a world that is unknown and a world that is. Even in the real world I felt like something's seemed to be in the future, like the Webb as they called it. The narrator Mikael Naramore was new to me. I haven't listened to anything this narrator had done before now. I felt like his performance of Rune Gate was wonderful. He kept my interest throughout the story and that's always a plus. His accents for each character was exceptional and he did an amazing job. I'm very eager to listen to more stories that this narrator has done. I really enjoyed it and I highly recommend you get this story and the second one, Chosen as soon as possible. I think you'll love it as much as I have. Another smash by Mark E, I loved reading the Merkiaari War series and even though ‘Paranormal Fantasy’ isn’t my normal cup of tea I was eager to give this one, from my ‘Essex neighbour’ a go, especially after doing some research into Mikael Naramore. I loved the cover art which gave us our first insight into our beautiful heroine Alex York, as they say a picture is worth a thousand words, but Marks text and Mikael’s telling bring that picture to life. So she’s back home at her grandparent’s farm after an ignominious retreat from Los Angeles and thrown straight into the mayhem of mutilated murder, using her mystical gift to its best advantage. The character development is strong from the off and I easily associated with each as they were introduced. With the story moving swiftly along, Douglas’s introduction and his ‘history’ was a pure surprise and I was kept totally engrossed in the tale, by the end I needed to know what was going to happen in ‘Chosen,’ the next book in the series. The storyline is fascinating and the pace enhances the persuasive commentary with details sufficiently succinct to allow the reader to inhabit the proceedings as if they were beamed into the action. Mikael has that rare talent for bringing the written word to life, subtly changing pitch, pace tone and tempo for each character so they are easy for the listener to differentiate. Like Natalie @ Book Lovers Life I to was really impressed by his range of accents and allowed for easy recognition of each character. The mystery Mark has woven will keep you reading into the small hours and (if you’re listening on Audible) Mikael’s narration will have you sitting in your car long after journeys end. I highly recommend this wonderful piece of work and would urge you to listen rather than read as the genre works so well in this instance, bring on book 2. What made the experience of listening to Rune Gate the most enjoyable? Everything! It was creative and entertaining! I think the author has a wonderful imagination and i will definitely be looking for more from him! I loved the main character Alex! She is spunky and talented. I love her compassion! This story is just as awesome as his other narrations I've heard! He has a wonderfully entertaining voice and way of drawing you into the story! I loved this book. I have read a few Mark Cooper books before and can't wait for more! I would highly recommend this book to anyone interested in the paranormal and witches! Would you listen to Rune Gate again? Why? I would listen to this story, and any others in this series and by this author. It draws you in from the very beginning, and it's plot and flow are smooth and excellent. The details are enough to allow me to envision not just the events that are occurring, but the world in which they take place. What other book might you compare Rune Gate to and why? I would compare Rune Gate to Star Wars Republic Commando Hard Contact, by Karen Traviss. Though Karen Traviss and Mark E. Cooper have different writing styles and pacing, the two books are similar in that they draw the reader into the world of the book. The characters are real and complicated, just as real people are. Mikael Naramore's performance was amazing. He gave life to both the words spoken by the characters and the words describing them, their actions, and the world they inhabit. There was no rush at all, except when a character was 'speaking' that way. This book played my emotions like a violinist plays a Stradivarius. I laughed at the parts that were humorous, felt my heart pause at the suspenseful moments, and was emotionally drawn to each part of the book. I was honored to be given a chance to experience this book. And it is, indeed, an experience. If I made a list of my Top 5 favorite authors, Mark E. Cooper would be assured of a place on that list. Alex York comes back to her home town after working in Los Angeles. As someone with the supernatural talent of being able to listen to others' thoughts and to be able to see what happened in the last moments of someone's life, Alex is called upon by the local police force to help solve a horrific murder. Can Alex do this without losing herself to the evil involved? 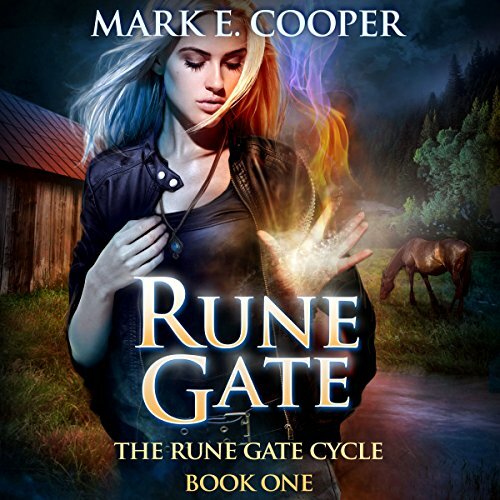 Rune Gate is book 1 in the Rune Gate Cycle series. It is a great first book. The characters are well developed and the story moves along at a good pace. Mr. Naramore's narration is compelling and kept me interested in the story. I can't wait to see what happens in the next book. Lots of build up without a satisfying finish, glad I have book two ready to go. My one complaint is that the main character in this book is female and judging by the artwork is the main character throughout the series. Based on that I would have rathered a female narrator, that said the narrator does a passable female voice and each character has a desirable voice so that is good. With that said I do have to admit the book had more male characters than female so the choice may have been based on that. As for the story I find I am hoping the main character grows more of a spine in the future. She seems strong willed but her lack of "defenses" paired with every third character wanting to protect her makes her seem weak and weak main characters are.... at best two dimensional and considering there is something like a dimensional gate this story is built around she better get some more dimensions or the plot will out shine the main character and I will lose interest. However, the first story has built up enough interest for me that I will move on to book two. I may have abandon the series if I could not get book two quickly. I got this book as part of a promotion by the author, who provided the Audible credit in return for an honest review, so here goes. I really enjoyed this book. It is a good mix of a crime drama and urban fantasy. The book starts off with a murder, and the main character, a witch named Alex York, being called in to consult. Her witch powers seem more psychic in nature than magic, being of the mind reading and seeing the dead kind of thing, and thats what Alex thinks too. She is so sensitive to being around others that she cant stand being touched, since it brings on mind reading she can't control. The murders she is called in to consult on are ritualistic in nature, very gruesome. The killer is a blank to ger senses though. As the story persists, and as bodies keep popping up, Alex is at a loss as to who the culprit is. As she is driving down the road one night, thinking about the case, she is distracted and accidentally hits a man that mysteriously appeared in the road. She takes him to the doctor, who treats his broken leg. The mans name is Dug, and he, it turns out, is from an alternate dimension, where magic is real, and he is a Duke on the search for an evil wizard. Their cases cross path, and it turns out they are looking for the same person. The action picks up from there, racing to a a climactic confrontation, which ends in a cliffhanger, but which makes sense in context to the story. An excellent read, for fans of either genre. The love quadrangle in the story between Alex, the Sheriff, who dated her in the past, Dug, and a friend from Alex's past does get a little complicated, but it does start to sort itself out toward the end of the book. Fans of Kim Harrison or Jim Butcher should like this story. I feel that I can assess the audio performer's work fairly, and it was quite well done, with excellent delineation of characters' voices. Unfortunately, I can only give presumptives on the story as I had to skip through because of the triggers(it's a PTSD thing). There are audiences who will be thrilled with the detailing, and the story line did seem sound. Loved the characterization of Alex and her dealing with her gift.